Matthew Stafford and Russell Wilson meet in The Emerald City. 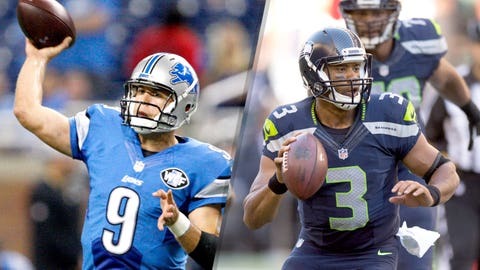 The Detroit Lions (0-3) and Seattle Seahawks (1-2) appear to be headed in opposite directions. With the return of Kam Chancellor in Week 3, Seattle nabbed its first win over a struggling Chicago Bears team sans Jay Cutler. Detroit, however, is off to its worst start since 2010 when it finished 6-10. While the Seahawks defense is as strong as ever (third in total defense), the offense is still a work in progress. As for the Lions, they’ve put up 28 points combined in the last two games after scoring 28 in the season opener at San Diego. Here are three keys to the game for both the Lions and Seahawks. The Lions’ offense has gone stagnant. It’s time to open things up, if Detroit’s offensive line can afford Matthew Stafford enough time to look deep. Through three games, tight end Eric Ebron leads the team with an average of 12.1 yards per reception. Calvin Johnson’s average, 10.0 YPR, is down from 15.2 in 2014; Golden Tate’s has dipped from 13.4 to 10.7. The Lions must at least test Seattle’s vaunted secondary with their talented receivers. This is a difficult line to walk. The Lions need to take some chances in order to spark their offense, but at the same time they can’t be too loose with the ball. Detroit has eight giveaways on the season (second-most in NFL). The Lions can beat a stingy Seahawks defense with calculated strikes, well timed and properly executed. Recklessly chucking the ball downfield against Seattle’s ball-hawking defensive backs won’t get the job done. The Lions won’t win if they forget to cover the tight end. After a couple quiet outings, Graham made a statement in Week 3. He led Seattle with seven catches for 83 yards and a touchdown, powering the Seahawks to their first victory. Detroit has allowed opposing quarterbacks to complete 78.2 percent of pass attempts through three games (second worst in NFL); shutting down an easy target like Graham won’t be easy. The Seahawks offense has yet to show any type of consistency through three weeks. Against a subpar Bears defense, both the passing and running game stalled, and the offense had to settle for field goals. Seattle ranks 28th in red-zone scoring percentage (touchdowns only), converting at a 37.5 clip. That won’t work against much better teams the Seahawks have yet to face. It’s no secret that Johnson is arguably the best wide receiver in the game when healthy. He’s also Stafford’s safety valve; throw it up and Johnson will likely come down with the ball — even among three or four defenders. Force Stafford to find other receivers, instead of allowing Megatron to do as he pleases. Detroit allows 112 rushing yards per game, 12th in the league. Though Marshawn Lynch’s status for the game is 50-50, undrafted rookie Thomas Rawls showed his ability to produce when given the opportunity. An effective run game will in turn open up the passing game — another area where the Lions struggle — for Russell Wilson and his weapons on the outside.